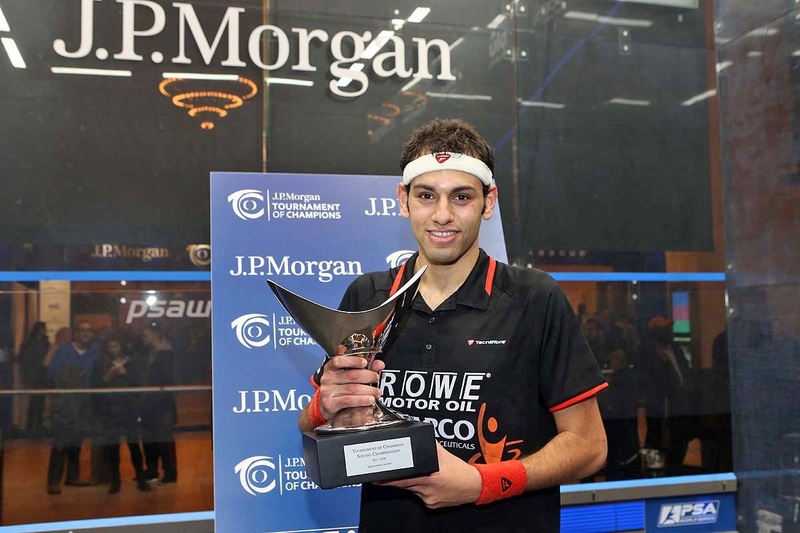 Elshorbagy, who has been at the top of the world rankings for three months, produced an impressive performance to defeat Matthew, the three time world champion, as the Egyptian bounced back from losing the first game to turn the match on its head, earning a 2-1 lead. Despite leading 9-7 in the fourth game, Matthew was unable to level the scores as an unfortunate bounce saw Elshorbagy claw his way back and claim the victory on a second match point. The Egyptian, ten years Matthew's junior, was full of praise for his opponent afterwards, saying "I told Nick at the end of the match that he is an inspirational player". "He's the king when it comes to playing tough matches because he seems to come back fresh every day but I'm really pleased with how I played and to get my first title here," he added. "I wanted to win so badly and I'm proud to see my name join the illustrious list of previous Tournament of Champions winners." It was double delight for Egyptian squash in New York as Raneem El Welily claimed the women's title, overcoming Alison Waters by a 3-1 scoreline. El Welily, like Elshorbagy, found herself a game behind, before levelling the match in a very close second game which ended 12-10, and the Egyptian seized the initiative winning the next two games comprehensively 11-4 to become the Tournament of Champions winner. The success of the tournament comes at a time when squash - along with other sports such as baseball/softball, surfing, karate and skateboarding - are bidding to be potentially added to the Olympic programme at Tokyo 2020.